The development of my woodworking skills is best documented by the mistakes I've made along the way! I've learned more from this project than I ever expected. I designed the shoe rack to be constructed from standard lumber sizes available at the hardware store. 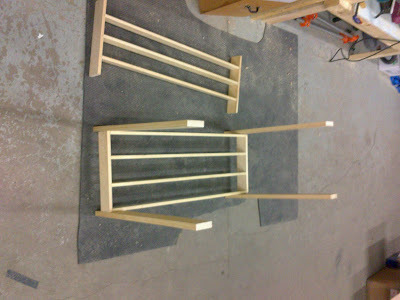 The joints are all dowel joints which I thought would be pretty straightforward to make and great for hiding mistakes. After cutting all the timber to what I thought was the right lengths, I set about marking and drilling the dowel holes. I used my new marking gauge which I think I've finally got used to using. For this kind of project where there are lots of repeated cuts and holes to mark it was invaluable. I could set the gauge once and mark out all the pieces in next to no time. I should have bought this before starting my box project. At this stage of construction I realized my first mistake. Pick the right dowel size. I went to the local Busy Bee Tools shop and bought a tub of 8mm wooden dowels - thinking that they looked about right for the job. The problem is that most of the lumber used in this project is 1/2" think, which is 12.25mm. For an 8mm dowel with room for glue I need a 8.5mm hole. This means I have less than 2mm either side of the hole. When you factor in my error in marking and drilling, the hole can end up being less than 1mm from the edge of the wood. This might be acceptable if you are using a drill press, but if you are using a hand-held drill it is really easy to get tear out. 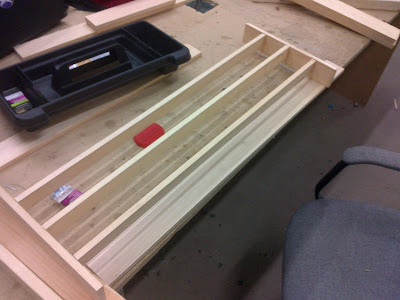 In the future I will use dowels that are no more than 1/3 the width of the pieces being joined. 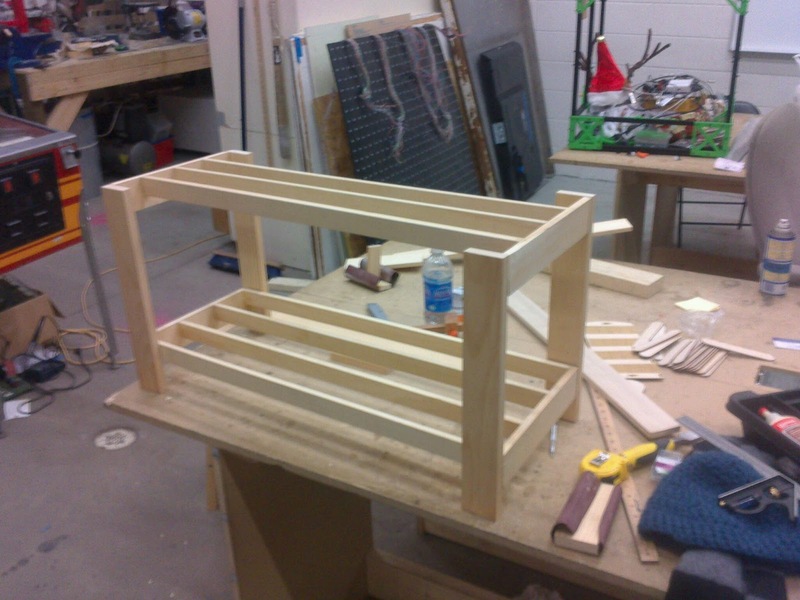 For this project, I really should have screwed and glued these small pieces and used dowels for the outer frame only. 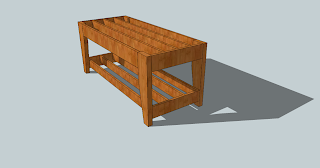 The second mistake was using the nominal wood thickness instead of the actual thickness when making the plans. I'm sure this will catch me out again, but its such an easy mistake to make. The picture above shows one of the shelves after the glue up. The glueing process was made difficult because I drilled the dowel holes too tight. Without room for the glue to exit the joint, I had to use incredible pressure to force the dowel into the holes. On several occasions this pressure caused glue to seep through the grain perpendicular to the dowel! Having glued the pieces together, I discovered I didn't have a clamp long enough to hold the work-piece together. This didn't seem too important because I knew the dowels were tight enough. I set the pieces to one side to dry and came back to find one of the shelves had twisted by about 1/4in corner to corner. In future builds I will try to clamp the pieces flat. The lumber had been stored indoors for several weeks before starting the project, so I do not think the warping was a result of the wood not being stable. I suspect a combination of very tight dowels, insufficient clamping and stresses in the structure due to poor hole placement caused the frame to bend. The warped shelf has caused the final structure to be slightly warped too!. The right, front-most leg in the picture below is higher than the other three by approximately 1/4". The good news is that my marking and drilling skills improved during the construction and the vertical pieces fit together well. The top, front and back horizontal slats are missing because these are the pieces I cut too short, as a result of assuming that the width of the 1x3" boards used for the posts was 3". The most useful outcome of this project will not be a shoe rack! 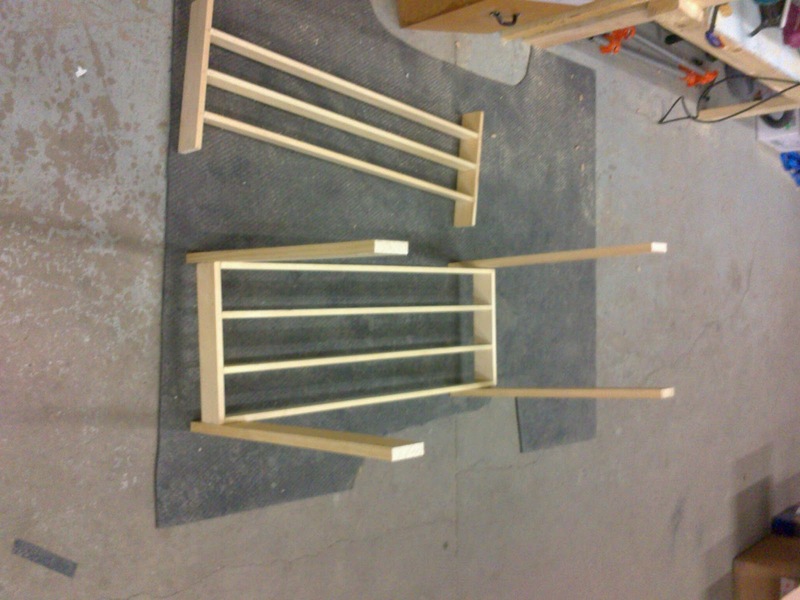 It will the be experienced gained from making something that was supposed to be a shoe rack! The purposes of this critical blog post is to document my mistakes so I don't repeat them in the future. It has been a lot of fun getting to this stage and although the results are a little disappointing, with some more glue and a pneumatic pin-nailer, I hope to square this thing up. I will post an update after the nail gun massacre. The great thing about being part of a hackerspace is that there is no shortage of power tools ... and people eager to use them! You can use a ratchet strap to hold things tight if you don't have a clamp big enough - you can get a big sliding clamp which is best if you are using a it a lot, but they're expensive. Looks good, though as you say, lots of experience gained - Rome wasn't built in a day! 6mm/ 1/4" dowels might have been a better plan! Generally let any wood sit for a day in the environment of the house before using it, though most of the time you can use it as-is. which software did you used to make the shoe rack(1st picture)?? ?